The Upper Tribunal (Administrative Appeals) seems to have taken an opportunity to re-state, in clear terms, one of the findings of SSWP v David Nelson and Fife Council  UKUT 0525 (AAC) [Our report here]. The key issue was the extent to which the benefit authority can rely on the landlord’s designation of the number of bedrooms. The case was an appeal by the LA from the FTT’s decision that a room with a useable floor space of 43 sq ft and a bulkhead in one corner could not be used as a bedroom by an adult or child. The landlord had classed it as a bedroom. 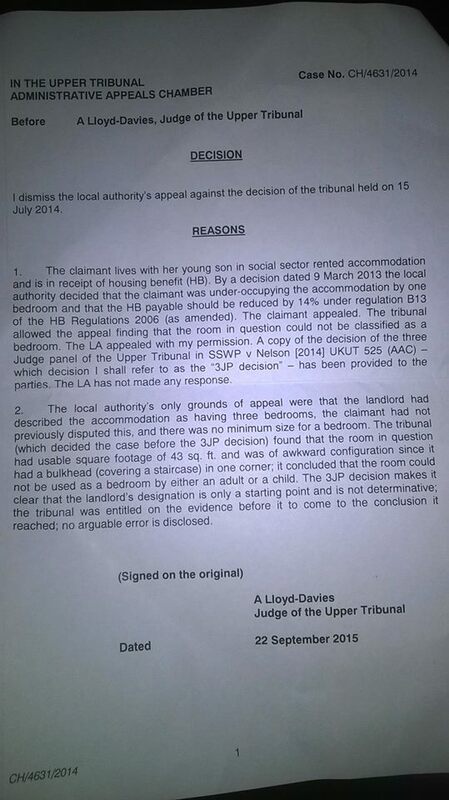 The LA argued that because of that designation and because the tenant had not previously disputed this, and because there ‘was no minimum size for a bedroom’, the FTT decision was wrong. Photo of the decision courtesy of Joe Halewood at SPeye Joe. So, what is the significance of this decision? Not, I think, an awful lot. We have known since Nelson that the landlord’s designation is not determinative (although apparently at least some local authorities have yet to catch up with the idea). But it certainly doesn’t retrospectively invalidate any decision made on the basis of the landlord’s designation, unless, perhaps, the LA had ignored or rejected any contrary information to that designation. LAs can rely on the landlord’s designation of the number of bedrooms, if that is the only information provided – but if there is any challenge or contrary information, the LA can’t simply point to the landlord’s designation as the be all and end all. Does this mean the Benefit Authority would have to investigate any disputed categorisations? I think it does. If the landlord’s description at letting is disputed, the Benefit Authority can’t simply rely on the landlord’s description, but has to come to its own decision. Clearly this has to involve investigating any grounds of dispute, so that the decision maker can give reasons for the decision. Cue HB decision makers with measuring tapes, preparing themselves to describe the elephant. Would a decision-maker’s failure to give reasons, or adequate reasons, for deciding on a disputed room be a ground of appeal? Quite possibly so. Posted in assured-tenancy, Benefits, Housing law - All, secure-tenancy and tagged bedroom tax, Upper Tribunal, Upper Tribunal Admin. A “bedroom” which is 43 sq ft, with a bulkhead covering a staircase? Someone in this local authority has surely mistaken the Harry Potter books for the HB Decision Maker’s Guide. I don’t get this. Doesn’t it depend on the shape of the room as well as the square footage? For example if it was 43 sq. f.t & was 8′ x 5′ it would take a standard 6’3″ x 3′ bed with space beside it, or if it was 10′ x 4′ it would be more questionable, or if it was L shaped or otherwise irregular it would be even more questionable. In other words, if I was asked to make a decision on whether it was a bedroom I’d want to see the room or, at least, a detailed measured plan & a lot of photos. Or does the definition of a bedroom include space for a wardrobe etc? As the judgment (and FTT decision) say, the room size, awkward configuration and the presence of the bulkhead meant the room was not practically useable as a bedroom. It is not about the size per se. my box room is around 48 sq ft floor space with bulkhead and an L shaped room. now my council are hiding behind the welfare reform 2012 act saying there isn’t a min size or usage rule and they are taking what my landlord as gospel and are refusing to come out and look and measure said room. my rep is joe halewood who im sure you will know and to say he is angry is an understatement with regards Ftt and the fact they made a decision without facts and today i’m in yet another argument with the council as they are saying they don’t have to follow the nelson case decision and that the HB regulations 2012 are right. Sorry to hear that, Bill. Good luck with it!